Its deep and aggressive sculpture provides to it an excellent mobility and grip in all kind of areas. Increased solidity and resistance against the aggressions. The extension of the sculpture of the sidewalls assures a comfortable driving on any road surface. The sophisticated profile of its tread avoids noise on road and increases itsmobility out of road. 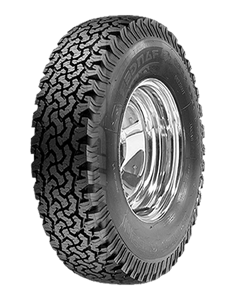 Sorry, we currently do not have any tyres with the Ranger pattern in stock.